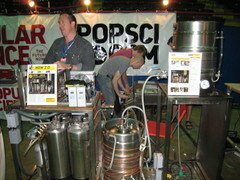 PopSci's booth at Maker Faire was a crowd favorite (and we're not just saying that)—mainly because the projects displayed by contributors John Carnett and Theo Gray were both ingenious and superfun. Want to make ice cream in 30 seconds, using liquid nitrogen? No problem. How about an automatic beer-making, storing, and pouring machine? You can make one. Video games your thing? Build a beautiful arcade table for your home.